The subject for this challenge is Baby and the Shabby Chic Technique shown on Isa's blog http://carteajouer.blogspot.com/. shabby chic items are chosen for their age and signs of wear and tear or new items are distressed to achieve the appearance of an antique. At the same time, a soft, minimalistic, and feminine feel is emphasized to differentiate it from regular vintage decor; hence the "chic" in the name. I chose my paper to be pink for a girl baby, the only link to the baby subject I'm afraid. 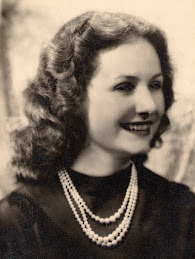 I wanted to focus on the feminine and antiqued side of the challenge. The cardstock is embossed and attached to the playing card with decoupage medium, thin watery shades of pale pink and ivory acrylic paint are brushed lightly over the whole card. The embossed stems and flower petals are then highlighted with a dab of white acrylic paint to make them stand out more. I edged the card with ivory cord with beads and punched a heart out of the original cardstock and again brushed lightly with watery pink paint. 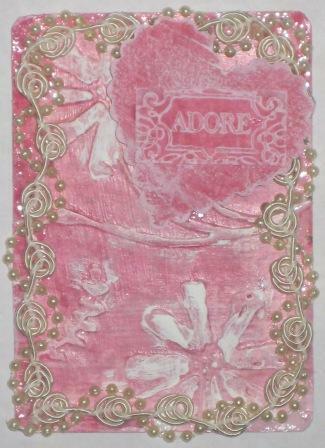 The "ADORE" saying was stamped with pink acrylic paint and attached directly onto the heart. The heart is placed at an angle on top of the corded edge. If you click on the image you can see the detail better. Hi Paula ! I say : Mission accomplie ! Chic and shabby would be the right words for your card. And so feminine ! I "adore" it ! You can find there a lot of other flowers. And, no, I didn't crochet the flower myself. It is made with a scrap of "dentelle". Hi Paula! so pretty card! gorgious!! !